Kirk Bell July 28, 2017 Comment Now! Audi’s turbocharged 5-cylinder cars have a short but distinguished history. The Audi Quattro burst onto the scene in the early 1980s and won multiple driver's and manufacturer's titles in rally racing. In 1987, an Audi 5-cylinder was the first car to run up Pike’s Peak in less than 11 minutes back when it was still a gravel trail. And an Audi 90 finished third in the IMSA GTO championship in 1989. For the 2018 model year, a 5-cylinder Audi is the most affordable way you can buy a high-performance Audi Sport model. 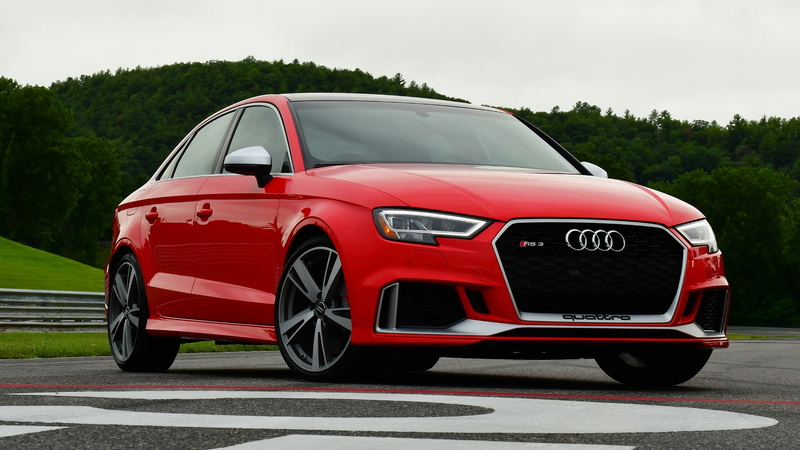 The 2018 Audi RS 3 is a 400-horsepower inline-5-cylinder hooligan of a performance car with just the right amount of Audi civility. It’s a compact sedan that can seat four fairly comfortably or attack a racetrack with gusto. The heart of the RS 3 is the 2.5-liter turbocharged 5-cylinder that, when on boil sounds like an angry beehive trapped in a coffee can. This is the second generation of this engine to make it to the United States, and it’s all new this time around. The first-gen made 360 horsepower and came in limited numbers (just 800 cars in total) under the hood of the TT RS for the 2012 and 2013 model years. This time, the 2.5 trades an iron block for all-aluminum construction while adding port injection to the existing direction injection. Its turbo huffs 19.6 psi of boost down its gullet, helping to create 400 horsepower from 5,850 to 7,000 rpm and 354 pound-feet of torque from 1,700 to 5,850 rpm. 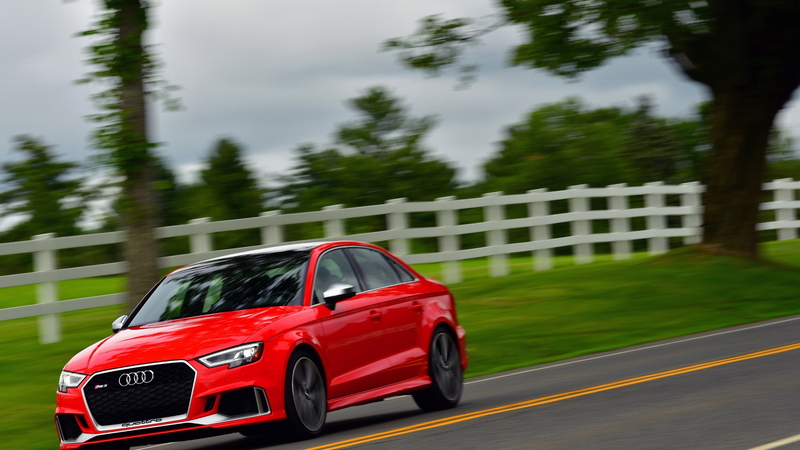 The engine sends its power through a beefed up version of Audi’s S Tronic 7-speed dual-clutch transmission to all four wheels via a similarly strengthened Quattro all-wheel-drive system. This version of Quattro is specially tuned to deliver as much power to the rear as possible, especially in Dynamic mode. With all that power and grip at its disposal, the RS 3 can vault from 0-60 mph in 3.9 seconds—about the same amount of time it takes for a whole beehive to attack you once you’ve disturbed it. A launch control feature is needed to achieve that number, and it’s easy to operate: put the car in Dynamic mode, turn off the traction control, put one foot on the brake, mash the throttle, release the brake, and let the bees swarm. The power is breathtaking and sudden, and the 7-speed cracks off shifts quickly provided you pull back on the shifter one time to engage the transmission’s Sport mode. The angry bees are the result of the engine’s 1-2-4-5-3 firing order, and they don’t sound so angry if you go easy on the throttle. Rail on it, though, and the whole hive gets agitated, the engine belches between gears, and it snaps and crackles a bit upon overrun. It’s a joy to the ears. The RS 3’s layout isn’t ideal for a sports car. It’s based on the MQB platform that it shares with the TT and VW Tiguan. This is a front-wheel-drive-based layout with the engine mounted transversely ahead of the front axle. It creates a nose-heavy weight balance approaching 60 percent at the front, but the effect isn’t too detrimental on the street or the track. That’s because Audi has put a lot of effort into making this a true performance car. It comes with magnetorheological dampers, stiffer suspension settings, and variable ratio steering that starts at 14.6:1 and progressively ramps up quicker than 13:1 the farther the steering wheel is turned. The track is also about 0.8 inch wider front and rear to handle wider wheels and tires, and the fenders are correspondingly wider as well. The brakes are beefy as well, with 14.6-inch discs up front clamped down on by 8-piston fixed calipers, and 12.2 discs out back. Those who want to track their cars should opt for the Dynamic Plus Package, which comes with a carbon fiber engine cover, carbon ceramic front disc brakes, steel springs with fixed dampers, a 174-mph top speed (up from 155), organic LED taillights, and a tire-pressure monitoring system that also shows tire temperature. 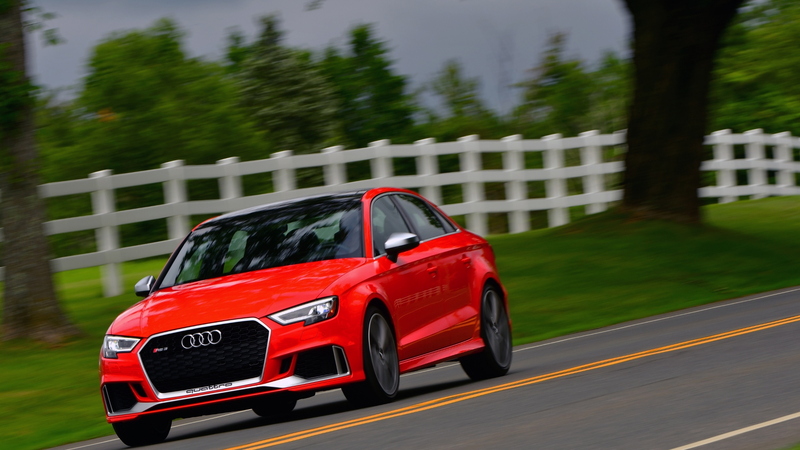 To show off the fruits of its labor, Audi invited Motor Authority to test the RS 3 on the track at Lakeville, Connecticut’s Lime Rock Park, and on the streets of the sleepy New England towns surrounding the picturesque track. On the track, the RS 3 is a ball. While it isn’t as precise and direct as its TT RS cousin, this is a sport sedan, not an all out sports car. That means it requires a little bit more finesse to get the most out of it, but the underlying character is the same—you just have to drill down to it, often with your right foot. As I stated in my review of the TT RS, it is a sports car that responds well to lift-off oversteer. The strategy is simple. With all that weight over the front end, the car wants to push when driven hard into a corner. Instead of decrying this as a flaw, use it. You can almost overdrive the car into a given turn until it looks like it’s going to wash out, then simply lift your right foot, let the weight settle over the front end and create more tire contact patch. At that point, the front end will tuck in and turn. The TT RS is easy to catch when it starts to rotate, so you simply point the car in the right direction, get back on the throttle, and let Quattro pull you out of the turn. The same goes for the RS 3, but the ballet is more expressive. With a higher center of gravity, the car pitches over a bit as it rotates, and with a longer wheelbase, the rear end is slower to come around. It’s still progressive and easy to control, and that quick-and-quicker steering helps make the most of it. Still, the RS 3 requires a more aggressive driver to make the dance happen, but when you get it right, it’s quite rewarding. 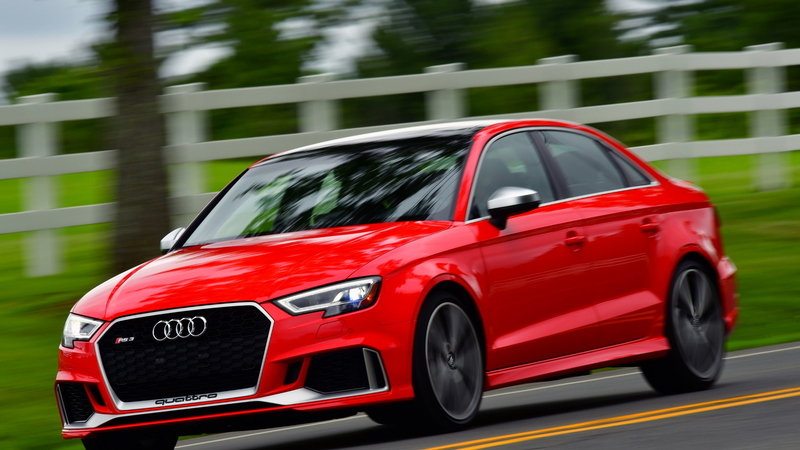 On the street, the RS 3’s softer suspension setup and taller ride height gives it a smoother ride than the TT RS, making it a firm but generally forgiving car that could do duty as an everyday driver. 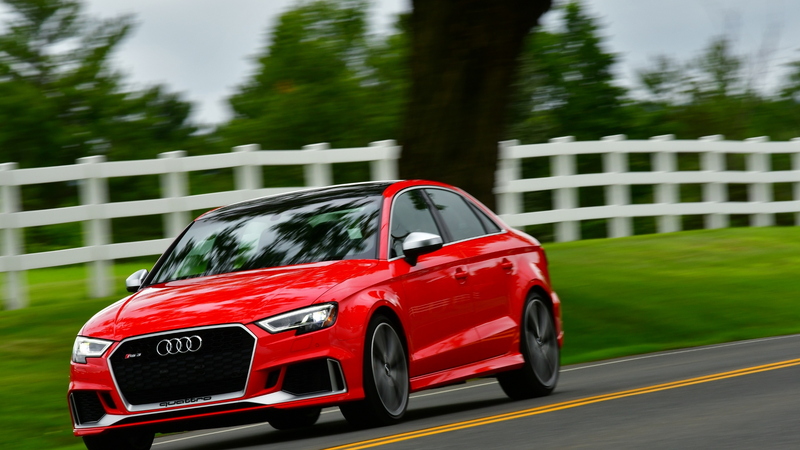 The 2018 Audi RS 3 starts at $55,875, including destination, making it the most affordable Audi RS model. For that money you get manually adjustable nappa leather sport seats with a diamond pattern upholstery and more than enough lateral and back support, a grippy leather and Alcantara flat-bottom steering wheel, an Alcantara-covered shift knob, the MMI Touch control interface that recognizes fingertip inputs, and a Panorama sunroof. Seat heating, dual-zone automatic climate control, and aluminum trim are also standard. Most buyers will also want the $3,200 Tech package, which adds the Audi Virtual Cockpit digital instrument cluster, navigation, a 14-speaker Bang & Olufsen sound system that cranks out 705 watts of power, and six months of Audi Connect Prime and Plus, which includes Google Earth map views, access to internet radio, and a wi-fi hotspot, among other features. Bottom line? For under $60,000. You get Audi civility with real track capability, and you punch your ticket to the expanding Audi Sport lineup. It's one heck of a fun combination. Angry bee sounds included.